Light and delicious! No need to make sure you're staying within your food-point range with this healthy dish. 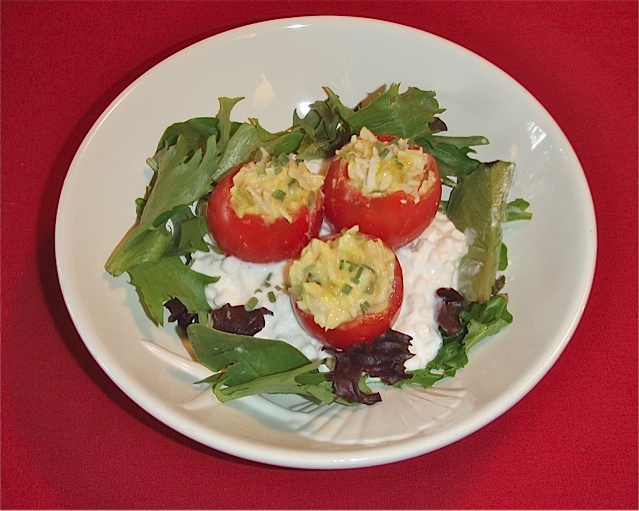 Less than .5 points per serving, feel free to fill up on these wonderful chicken salad stuffed tomatoes! Cut the tops of the tomatoes and carefully scoop out the insides. Place tomatoes upside down on paper towel to drain. Mix the chicken, mayo, mustard, and relish together. Spoon chicken salad mixture into each tomato and serve on bed of lettuce and/or cottage cheese. Enjoy this light and tasty low-point meal! If you'd like a printer-friendly version of this recipe, Click Here.